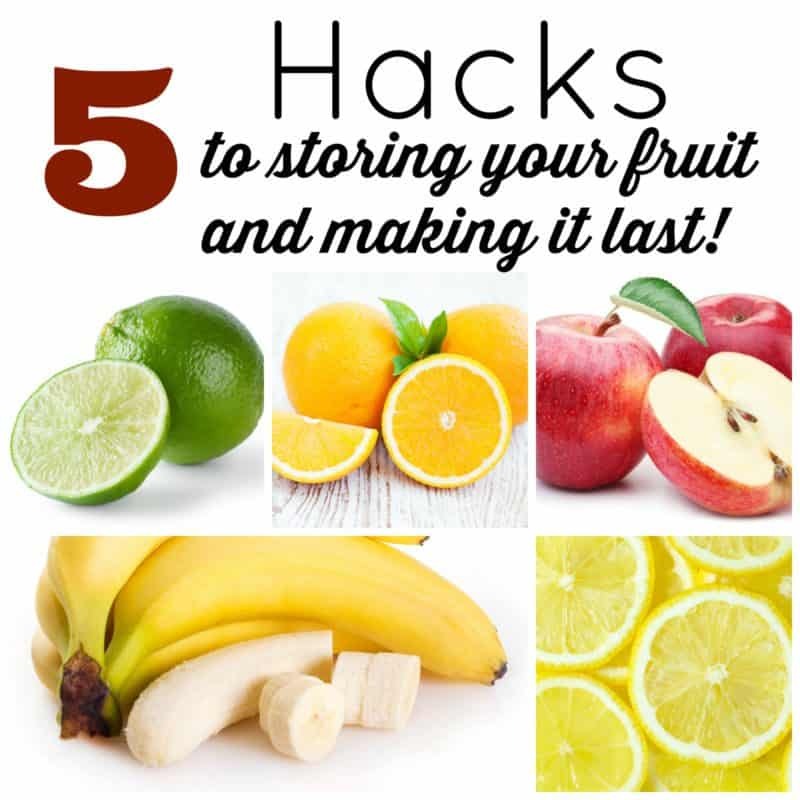 Here are five hacks for storing fruit that actually make it last longer. Summer is the perfect time to buy lots of fresh fruit. We love to buy it at fruit stands and I am always looking for a deal a the grocery store. I love to make homemade jam when strawberries and raspberries are in season. A few years ago I realized I did not always know the best way to store fruit to make it last so I did some research. Do you have any tips for storing fruit? Let me know in the comments. Wrap banana stems with plastic wrap to help them not ripen as quickly. Did you know you can freeze bananas? I place brown or spotted bananas in the freezer and always have ripe bananas for baking. See banana bread recipe below. Remove all bruised or spotted apples and store on the counter (eat within one or two days). Store other apples in the crisper drawer in the fridge (or the coldest spot). Consider throwing a wet paper towel over the top they will last even longer. Oranges last about a week at room temperature, to extend that time to 2-3 weeks store in the fridge. Store on the counter out of the sunlight. They will last about a week. For longer lasting lemons store them in the fridge in an airtight ziplock bag in the crisper drawer (slide the humidity level all the way to the left or to the lowest setting) they will last for up to four weeks. Store limes in the fridge in a loose plastic bag for one to two weeks. After two weeks you can still use them but they will lose some flavor. You can also store lime wedges or slices for about a week in a plastic bag. Lime juice is good even longer. You can store lime juice for four months in the freezer.